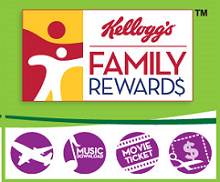 mommy's reviews: 25 FREE Kelloggs Family Rewards Points! Hey all! Right now, you can get 25 FREE Kelloggs Family Rewards Points by entering the code below. Not sure when this one expires so get it in your account today!